Last year, when we traveled to England, we made a day trip to Edinburgh. We didn't have any firm plans or even remarkable expectations for our day there. We selected a few sites that we wanted to see, and beyond that we figured on wandering around and being surprised. My focus when planning the trip was always on England and a day in Scotland was more just to say we'd been there than anything else. (I know that sounds like an awful attitude to have towards Scotland but we are planning to one day travel to that country and explore it more thoroughly. It's turn will come! Patience, patience . . . !) Because I hadn't really done any research on Scotland, I really had no idea what to expect and found myself surprised by a few literary discoveries. 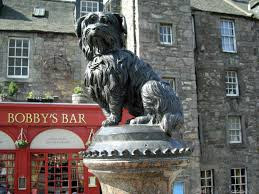 One such surprise was discovering that Edinburgh was the home of Greyfriars Bobby. First, we passed by his statue which caught my eye immediately. Glancing rapidly around I saw Greyfriars Kirkyard and my excitement increased. I recognized all of this from my list of Disney movies based on books. (Yes, I am remarkably educated, thanks. Heh.) 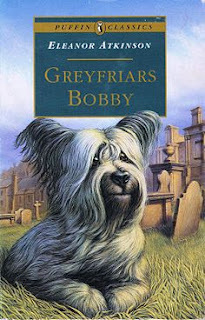 Greyfriar's Bobby has been on my list of books I'd been wanting to read, but I had not yet purchased a copy. It seemed like the perfect day and the perfect location to buy a copy of the book! As it turns out, it was a good idea to buy the book there because nice looking copies do not seem to be readily available in the U.S. The copy I picked up is the one I have pictured here. Now here is where I also must confess that at the time of our visit I had no idea what the story was about, other than it being about a dog (that apparently lived in Edinburgh). In case you are also unaware of the story line, I'll fill you in so that you can decry ignorance and be better informed than I was. Greyfriars Bobby is the true story of a highland terrier that was extremely loyal to his master, a man by the name of John Brown who died of tuberculosis in 1858. After his death, Brown was buried in Greyfriars Kirkyard. The profession of John Brown is in dispute; some say he was a shepherd and some say he was a policeman. It is more commonly believed that he was a policeman but author Eleanor Atkinson decide that, for the purposes of her story, she would make him out to be a shepherd. One thing is certain, no matter Brown's profession was, it is pretty safe to assume that no one would remember him at all if not for his dog. Bobby was an extremely loyal animal and mourned his owner's death for the remainder of his life. Bobby refused to leave the graveside, keeping company with it for the next fourteen years. Dogs weren't allowed in the Kirkyard but they had a hard time keeping Bobby out! This loyal little dog, through persistence and loyalty, was eventually made a pet of the neighborhood but spent every single night sleeping on his master's grave, no matter the weather. What I did not realize until I was done reading the book is that the author, Eleanor Atkinson, was an American who never actually visited Scotland. (So if anyone is upset with me for not doing more thorough research on that portion of our trip, I think I should win back some brownie points for at least visiting.) The story was written in 1912 and although she wrote a handful of other books, this is the one that she is best known for. The Disney version of the film is based on her version of events. Critics have argued that she didn't understand the geography of Edinburgh very well and that is a fair thing to note. Having walked the city, I was confused a bit by her placement of the castle, in particular, but for someone who had never been I think she did quite well. She is assumed to have researched the names and people directly related to Bobby's story, keeping as true to his account as possible. Obviously she embellished the tale a bit with the use of her imagination but that is to be expected of any author. Because of this, I had a really hard time working my way through the story. I found myself skimming past dialogue, hoping to pick up enough out of the conversations between characters to track with the events until I could get back to the narrative. I can't imagine this being an easy read for a middle schooler (although not impossible). I confess that I will never attempt this book as a read aloud. The story is interesting enough but it doesn't feel accessible. I suspect that watching the movie is going to be the easiest way to educate one's self about this remarkable dog. I'll have to let you know whether that is true because now that I've read the book, I am permitted to watch the movie. (*wink*) I am very curious to see the Disney film now. 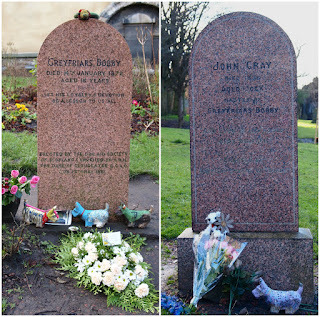 For more information about Greyfriars Bobby, check out this website. It is a rather interesting tale. If you want to learn more about Greyfriars Kirkyard, there are plenty of videos available through Youtube that will broaden your knowledge of this small portion of the globe. Our family spent some time wandering about the graveyard (because apparently J.K. Rowling named some of her famous characters after names she found on tombstones at this site! ), While I like wandering around graveyards as a general rule, I have to tell you this one was a little creepy. It wasn't until I was doing a bit of research for this post that I discovered why I felt the way I did about it. If you're curious, see Youtube. Videos there range from informative to downright spooky! Have you read this story? I'd be curious to know, if so! Greyfriars Bobby is ONE OF MY FAVORITE BOOKS EVER. I am thrilled to know you've read it and approve. I can't believe you actually got to visit the statue in Scotland... seems so magical! Interesting! I believe we have a picture book adaptation of this.